Many factors can lead to root canal failure, as the root canal system of your tooth can be complex. A root canal may not work if the bacteria load to start with is just too high to get under control. Other reasons for failure include the restoration leaking, the patient failing to maintain good oral hygiene, continuing gum disease, or the tooth/sealing materials have degraded or broken down over time. 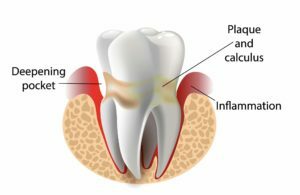 Cavities or gum disease can develop on a root canal treated tooth just like any other tooth in your mouth, it is very important to clean the tooth/crown very carefully and visit the hygienist regularly. Since the canals are sealed with root canal cement and the rubber filling material, there is no nerve in the tooth, you shouldn’t feel any symptoms if the tooth gets a cavity. The tooth would only hurt if it gets fractured (eg caused by trauma, grinding, etc) or gets another abscess around it. There is always a possibility of failure-things can go wrong during endodontic treatment that would not become apparent for a long time after the treatment is completed. Front teeth usually have single roots and canals. They are often easier to access and treat. Whereas back teeth have more roots and canals and are typically subjected to heavier biting force than the front teeth. There is a significant correlation between ageing and how resistant a tooth is to fracture. Teeth can become more brittle over time and have a greater tendency to develop cracks/fracture. This is part of the reason why it is a good idea to have a cuspal coverage restoration (onlay or crown) over a root treated tooth If the placement of the crown or other restoration was delayed following the treatment, bacterial re-infection of the root canals may be more likely. One of the most common reasons for failed endodontic treatment is that there is an extra canal in the tooth. Lower incisors, which often have only one canal, sometimes have a second, hidden canal hidden behind the first one. Molars with three roots sometimes have a four canal. If the extra canal cannot be found, it can eventually become infected, resulting in infection or an abscess. Sometimes, there is an obstruction that prevents the dentist from cleaning the entire canal of your tooth. Narrow or curved root canals can pose complications. There can be extra canal branches, deep in the pulp system of a tooth, it may be difficult or even impossible to reach with a dentist’s instruments. Extra canal branches, deep in the pulp system of a tooth, can be impossible to reach. Occasionally, there can be a mishap during the endodontic treatment such as files that become lodged in the canal, or problems in getting the filing instruments around curves. Sometimes these files can be retrieved, but many times they cannot. In the process of instrumentation, ledges can develop that can make it very difficult to complete the treatment. A root of the tooth can develop a crack, which makes it impossible to seal the canal and prevent infection from re-entering the tooth. Vertical root fractures often show minimal signs and symptoms and may, therefore, go unnoticed for some time and are discovered when the surrounding bone and gum become infected. Treatment may involve extraction of the tooth. Endodontic surgery is appropriate if the tooth can be saved by removal of the fractured root. 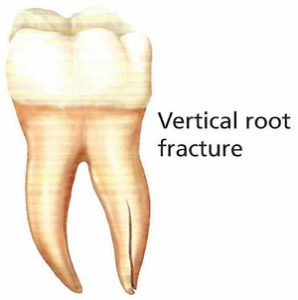 Vertical root fractures are cracks that begin in the root of the tooth and extend toward the chewing surface. For many of these problems, re-treating the tooth may solve it. The dentist can go into the tooth, remove the old endodontic filling material, and then re-fill it, getting a better seal the second time. The dentist can also send the patient to an endodontic specialist, who has special tools and techniques to deal with failed treatment. Statistically, the success rate of re-root treatment is less than first-time root treatment. Root canal surgery may also be an option. One type of surgery is an apicoectomy. This procedure involves accessing the root of the tooth through an incision made in the gums and bone. The tip of the root may be cut off and the area is cleaned and sealed from the end of the root. Sometimes, pain after a root canal can be difficult to diagnose and can be caused by problems unrelated to the root canal treatment like gum problems, sinusitis, TMJ or pain from an adjacent tooth. Statistically the success rate of re-root treatment is less than first time root treatment. In the case of a failed root canal, the chance that a re-treatment or surgery will succeed is 50% to 75% at best, depending on what is wrong.